Airplanes have always been a part of my life. My family was actively involved in aviation, and operated an FBO with sales worldwide for nearly fifty years. I acquired the first propeller in my collection when I was seventeen, a gift from my uncle when I received my private pilot’s license. Since then, I have become a dedicated collector of wooden ground adjustable and controllable pitch propellers. 36 years later my collection has grown to 112 propellers.Metal propellers replaced the majority of the early wooden fixed pitch propellers during the mid 1920s and 1930s. The wooden propellers represented in my collection are rare and of limited number due to the short period of production – eight years - and the conditions that affected them. Bird strikes, gravel and moisture made it difficult to keep them balanced. These propellers were easily damaged and not safely repaired which led most of them to be removed and discarded. By January 1941, nearly a year before World War II, manufacturers could no longer get aluminum-alloy sheet or even aluminum-alloy extrusions for use in light aircraft and commercial airplanes. The nation’s entire production of aluminum was being used for military purposes, either to build up our own forces or to help those who would later be our allies. During this time the wooden propeller returned to production to keep general aviation and the small military trainers flying.The shortage of aluminum before and during the war, led many manufacturers to design ground adjustable, variable pitch and constant speed propellers using wooden or composite propeller blades. Hamilton Standard had contracted with “ERCO” Engineering Research Corporation and Freedman Burnham Aircraft Corporation. to profile a wood laminate, “Compreg” propeller blade to retro-fit their metal SAE 20, 30, and 40 spline counterweight hubs. These Hamilton Standard propellers had been in production with metal blades from the early 1930’s and were only being used for the military. The wooden blade propeller manufacturers of this era were: Engineering Research Corp “ERCO”, Freedman Burnham Aircraft Corporation, Beechcraft “ROBY”, Hartzell “Hartzite”, Hoover Hydraulic Propeller, EVEREL Propeller Corporation, Aeromaster, Aeromatic Propeller, Continental Aviation Sky Power, Sensenich “Skyblade”, Maynard DiCesare, Gardner and Iso-Rev. 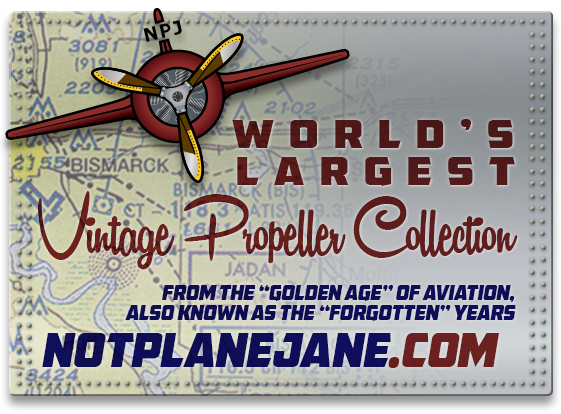 My collection focuses on the wooden propeller blades with metal ground adjustable, variable pitch and constant speed hubs from 1938 through 1946. Additionally, the collection contains a small number of metal propellers that represent the period prior to the wooden collection, the oldest a 1926 Standard Steel ground adjustable thru 1938 with a Hamilton Standard Hydro Matic 22D30. The Hydromatic propeller revolutionized the military and the airline industry due to its compact design that had demonstrated its safety and dependability in millions of flight miles. In 1946, after the war was over, aluminum was again available for propeller production and most wooden propellers were removed and again replaced with the more desirable and dependable metal props.While building this collection, rarely did I find a complete intact propeller. I found a single blade, sometimes a pair or a parts missing hub. The controllable propellers are much heavier than the wooden fixed pitch props commonly used as wall hangers and mantel displays. This caused many of the controllable propellers to be dissembled and displayed as a single blade with the hub simply discarded. It has been an interest of mine to preserve this time in aviation history. Now that it’s nearing completion, I want to share it with everyone that is interested in this era. 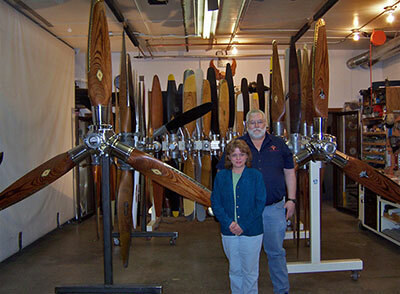 This collection is meant to represent, as completely as possible, a particular historical period, “the forgotten years of aviation”, along with an artistic beauty of the wooden propellers.With limited regulatory enforcement by the Civil Aeronautics Administration, records and maintenance were not kept as they are today with the FAA governing aviation. Much of the written information and vintage ads compiled on my web site were collected from hundreds of past issues of aviation magazines and journals dating back to 1925, manufacturer’s repair and service manuals and aircraft yearbooks. My research has involved the National Air and Space museum and aviation libraries around the country. I hope this web site will be useful to anyone that shares the same interest and be a resource of information.